Do you love eating jellies, jams and conserves? How about marmalades? These products are collectively known as fruit preserves. They are the ones that you usually see in cans, or they can be bottled for prolonged storage. The previously mentioned preserves are most likely the same, but they vary a little, depending on the ingredients used for preparing each type of fruit preserve. For the sake of discussion, it is best to note the differences between two fruit preserves, and these are jam and marmalade. To begin with, jams contain both the fruit’s juice and some pieces of its flesh. In addition, some professional cooking books describe jams as pureed fruits that have been either cooked or gelled. Jams usually make use of one kind of fruit or vegetable, and not a combination of two or more. Berries and smaller fruits are often seen as the mainstay ingredient for the most popular fruit jams today. You can tell if a certain jam is prepared well by tasting it, and feeling its overall consistency. The best jams, as they say, are those that are soft and even in consistency. You should not be able to feel the fruit pieces. These jams also share a full and bright color, coupled with a half jelly texture, which can be evenly spread, without noticing any visible liquid separating from the mixture. To prepare a jam, one must cut or crush the fruit, and then heat the components in a sugar-water mixture to harness the fruit’s pectin. 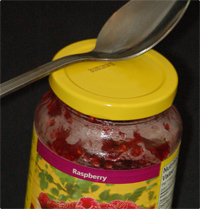 The resultant product is the actual jam, which is then freshly sealed in glass or canned containers. Marmalade is closely related to jam. They actually resemble the first cousin relationship. Like jam, it falls under the category of fruit preserves, but it is derived only from the combination of pure citrus fruits and the water-sugar mix. Other marmalade variations make use of some of the zest or citrus peel (not the whole fruit). This ingredient adds a mildly bitter flavor to the marmalade due to its oils. Oranges are perhaps the most popular citrus fruit to use for marmelade. Other citrus fruits taking the place of standard oranges are the grapefruit, lime and lemon. 1. Jams are made from one type of any fruit or vegetable, whereas marmalade must use a citrus fruit in its preparation. 2. Jams basically use the entire fruit by crushing, pureeing and cooking, whereas marmalades consists of the citrus peel (rind), pulp and the juice (not the whole fruit). Julita. "Difference Between Jam and Marmalade." DifferenceBetween.net. January 14, 2010 < http://www.differencebetween.net/object/comparisons-of-food-items/difference-between-jam-and-marmalade/ >.